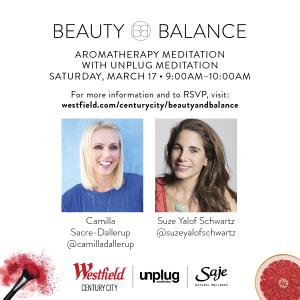 Join me at Westfield Century city for this awesome FREE aromatherapy Unplug meditation event! It’s happening this Saturday 17th March 9-10am in the mall at the Atrium. I will guide you through a deep relaxing meditation using the awesome technology from Sound off LA headsets plus Saje natural wellness divine aromatherapy oils to help you travel deeper into your meditation, so you can leave feeling reset and refreshed. Can’t wait!! See you Saturday. 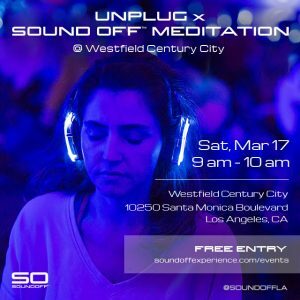 This is a collaboration with Unplug Meditation WEHO, Saje Wellness and Westfield Century city.